All our Pest Control services, including our fogging treatments, start with a free no obligation assessment. Once we have reviewed the nature of the infestation and understand what is required to resolve the issue, we will provide a quote and details of the work required. All work we complete is fully guaranteed and backed by our price match promise. This ensures that you are paying the lowest price available. If you should find a like for like service that is cheaper, then we will happily match it. Founded in 1992, Confirm A Kill is a family run business with over 25 years in the pest control industry. We are members of both NPTA and Prompt which means we are fully trained and certified to deal with all manner of pest control problems. Our discreet and professional service is used by both homeowners and businesses across Nottinghamshire. Fogging treatment is a highly effective method of eradicating flies and other insects quickly in both domestic and commercial buildings. The Ultra Low Volume (ULV) fogging treatment is a relatively new technique of light fumigation which is ideal for internal areas. The treatment emits tiny droplets of specially formulated pesticide. The size of the droplets is the key to the success of this treatment. The smaller the droplet, the better the coverage that will be achieved. Where other techniques fall down is their lack of coverage, but ULV fogging ensures that no insect can hide in spaces that are not targeted. 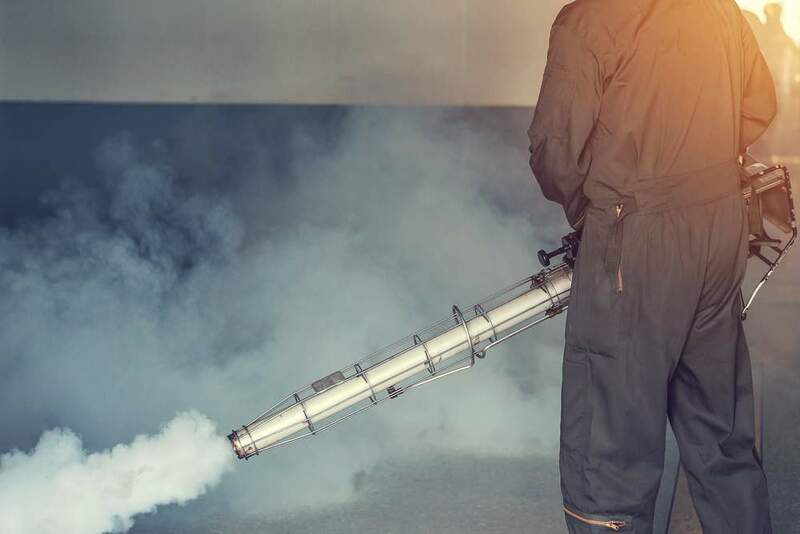 As well as being a very effective treatment for flying insects, fogging is also used to flush out cockroaches, fleas and bugs which have found their way in the structure of the building. Usually, ULV fogging treatment is combined with a residual coarse spray treatment and is highly effective at reducing insect numbers in a short space of time. Fogging should only be carried out by experts. The chemicals used can bring on symptoms such as asthma if the correct safety equipment is not worn. Fogging is often confused with fumigation. While the treatments do share some similarities, they are used for very different purposes. Fumigation uses a highly toxic gas and can only be carried out by professional and licensed fumigators. It is most commonly used in food processing, manufacturing and logistics. It is highly effective at killing bacteria, fungus and their spores. Due to the toxicity of the gases used in the fumigation process, it can only be carried out in an enclosed and airtight environment. Fogging creates a mist of tiny droplets using an insecticide and a carrier. It is far less toxic than fumigation and can be carried out by a trained Pest Controller. It is most commonly used for targeting flying insects, such as Mosquito’s. However, it is also highly effective in dealing with hard to get to pests. Fogging can be carried out in an open environment, but safety equipment should still be worn. A minimum time of four hours is advised before re-entering a space where a fogging has taken place. For an insect infestation fogging treatment is one of a number of options that we may suggest. If you believe you may have a problem with insects in your home or business premises, then you should contact us as soon as possible. We will carry out a full assessment and review of the area, identifying the pest and the causes and put together a plan for dealing with the issue. All our work is fully guaranteed so you can rest assured that we will solve your pest problem. If you think that you might need fogging or ulv treatments then get in touch with us for a free, no obligation quote.